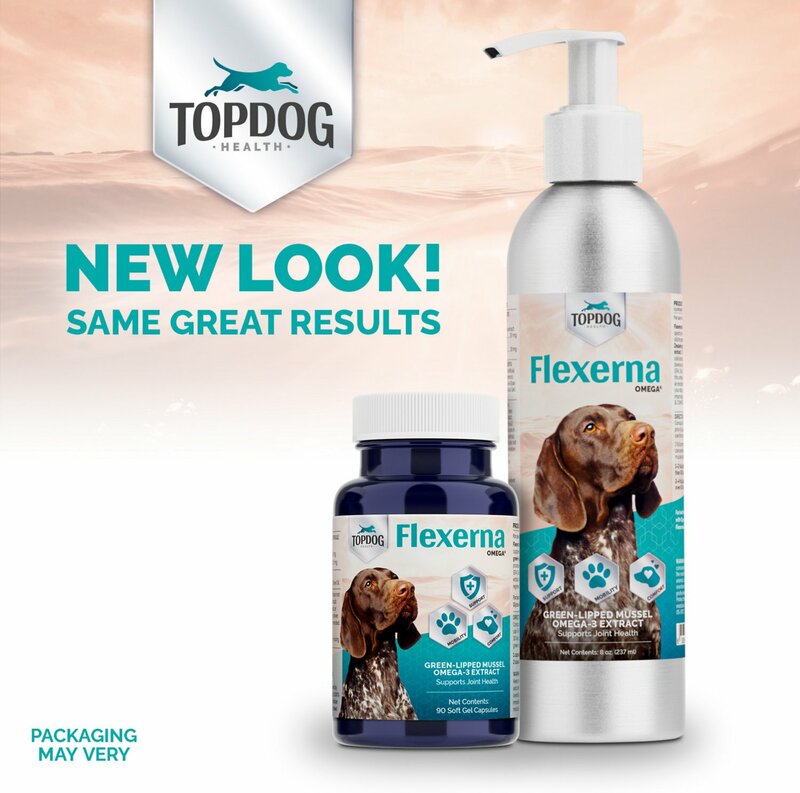 Help keep your pooch’s joints in tip top shape at any age with the TopDog Health Flexerna Omega Liquid Dog Supplement. 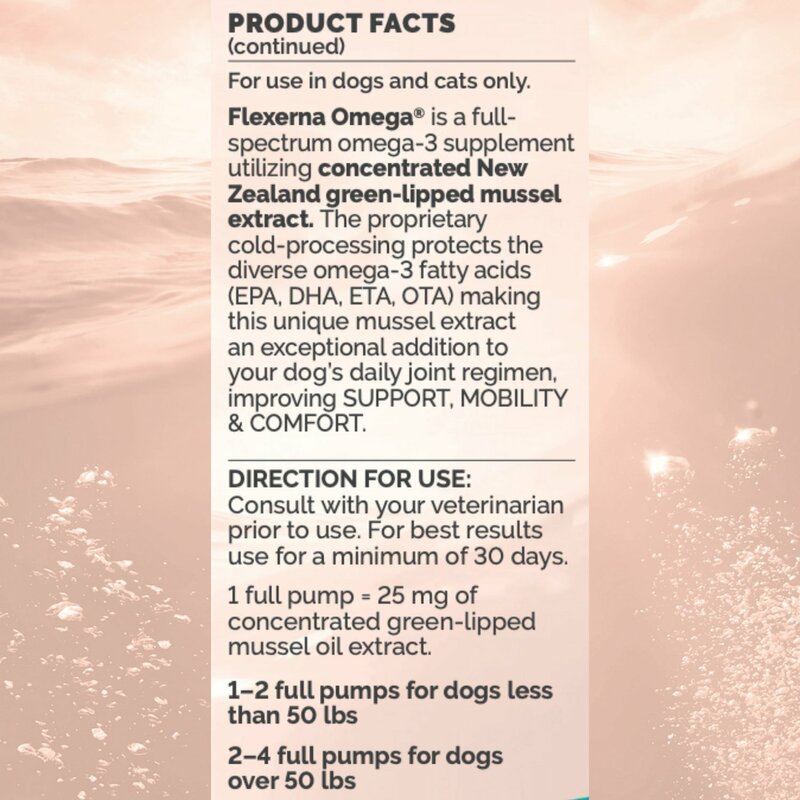 This liquid, easy-to-give formula is specifically formulated to nourish doggy joints, with a unique blend of pure, raw New Zealand green lipped mussel oil rich in eicosapentaenoic acid—a unique omega-3 fatty acid with scientifically proven benefits. New Zealand green lipped mussels are sustainably harvested from pristine waters, and a patented extraction process keeps the oil fresh and ultra-pure with every pump. The all-ages formula can be given to senior dogs to help maintain comfy mobility, very active dogs that could use the joint boost, and even puppies. Best thing, you can use less of it than you’d need with fish oil, and dogs love the flavor! Liquid omegas formula naturally supports joint mobility and comfort with ultra-pure New Zealand green lipped mussel oil. Packed with eicosapentaenoic acid—a unique omega-3 fatty acid from green-lipped mussels with proven joint-nourishing benefits—plus wild Atlantic menhaden fish oil and hyaluronic acid. Patented extraction process guarantees the purest, raw oil pump after pump, and it’s 100% eco-friendly and bio-available. 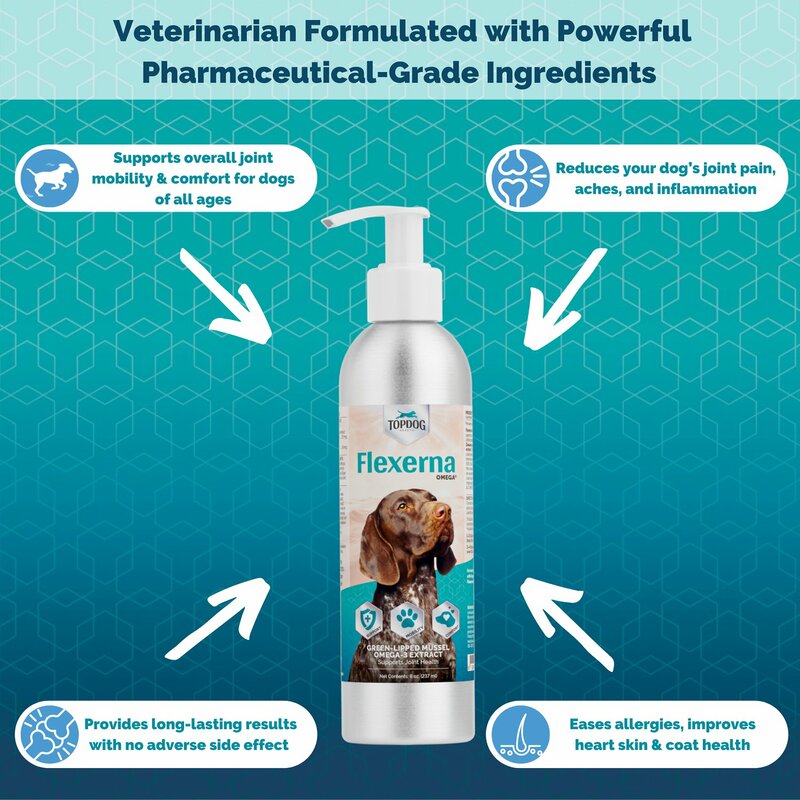 Requires lower dosages than fish oil to positively support joints, and is great for all ages—adult dogs, senior dogs, and puppies, too. Dogs love the naturally tasty flavor so it’s easy to give daily as a treat or snack, on its own or mixed into your pal’s favorite food. Safe use in pregnant animals or animal intended for breeding has not been proven. If lameness worsens, discontinue use and contact your veterinarian. Administer during or after the animal has eaten to reduce incidence of gastrointestinal upset. An examination from a veterinarian is recommended prior to using this product. For animal use only. Keep out of reach of children. Active Ingredients: Total Fat: 90%, Eicosapentaenoic Acid (EPA): 54 mg, Docosahexaenoic Acid (DHA): 50 mg, SuPernol (Perna Canaliculus Green-Lipped Mussel Extract): 25 mg, Sodium Hyaluronate (HA): 18 mg.
Inactive Ingredients: Rice Bran Oil, Fish Oil, Natural Tocopherols, Potassium Sorbate, Silicon Dioxide (Silica Gel), Artificial Flavor. Consult with your veterinarian prior to use. Allow 2-4 weeks for significant results. One full pump, given orally, delivers 25 mg of SuPernol. One full pump for dogs less than 50 lbs. Two full pumps for dogs over 50 lbs. Protect from heat, light, and moisture. Store at 59° - 86° F.
Easy to use. Highly recommended by my veterinarian. My dogs seem to feel better when taking it. I have my old Bella back thanks to Flexerna! I noticed that my active Lab mix was starting to slow down, especially after a day of a lot of activity. 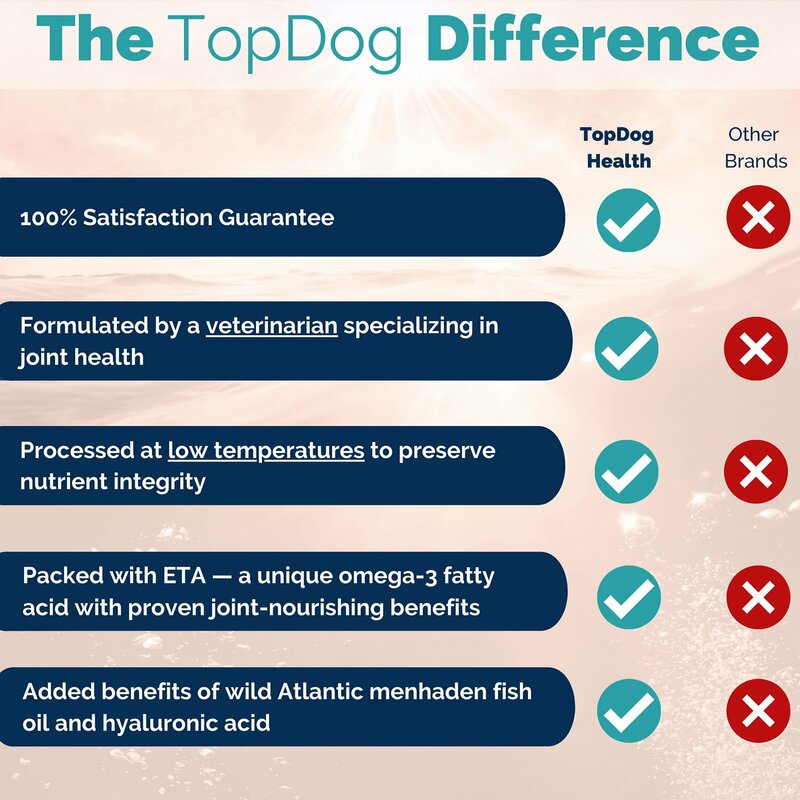 After doing research I found Top Dog and their Flexerna Omega-3 oil. She is back to her old self after starting her on the Flexerna. My original goal was to help with Bella’s joints, but I also noticed that her coat quality has improved and her skin isn’t as flaky. It was an added bonus that I wasn’t expecting, but I know Bella appreciates it too. I give it to her in her dry food at night and she eats it right up!